What separates the X-Men movies is their ability to introduce new characters through its series, compared to other superhero movies like Batman or Spider-Man that rely on the simpler formula of hero plus new villain or two for each film. The X-Men get their special powers through a mutation so they do not require elaborate origin stories and their numbers are still unknown so the story can introduce fun, fresh characters with new powers at any moment. This is most evident in the latest installment, X-Men Days of Future Past, an adventure/sci-fi film that involves time travel and includes many characters introduced, past and present. This film showcases the very talented actors that have come to play those characters in its early films like Hugh Jackman (Prisoners, 2013), Jennifer Lawrence (American Hustle, 2013), Michael Fassbender (The Counselor, 2013), Patrick Stewart (Match, 2014), Ian McKellen (The Hobbit: The Desolation of Smaug, 2013), Anna Paquin (Free Ride, 2013), Halle Berry (Cloud Atlas, 2012), Ellen Page (The East, 2013), and Kelsey Grammar (Legends of Oz: Dorothy’s Return, 2013). Although big star-studded casts can sometimes disrupt the flow of a movie to give enough screen time to all, X-Men: Days of Future Past does a great job of balancing time for each actor with an exciting plot and dazzling special effects. The movie starts out in the near distant future with a few surviving mutants on the run from Sentinels, machines that can adapt and are hunting down mutants and even humans. 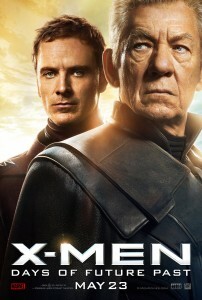 The surviving X-Men include Wolverine (Hugh Jackman), Professor X (Patrick Stewart), Kitty Pryde (Ellen Page), as well as their occasional nemesis, Magneto (Ian McKellan). Through the use of Kitty Pryde’s powers, the group sends back Wolverine’s mind into his past body to try and shut down the creation of the early prototypes of the Sentinals back at the end of the Vietnam War in 1973. One day, Wolverine wakes up in the 70s in New York City and needs to find the younger Professor X and Magneto with James MacAvoy and Michael Fassbender reprising their roles from X-Men: Origins. The mission is to stop a shape shifting mutant, Mystique, (Jennifer Lawrence) from murdering the Sentinel program’s creator Bolivar Trask (Peter Dinklage, Game of Thrones, 2014) and starting a war against mutants. Although the movie has some scenes that require suspension of disbelief regarding time travel, it is still a very enjoyable summer blockbuster. The movie capitalizes on Jennifer Lawrence’s vast success and features her prominently in the story. Jackman’s character is nicely woven in with other characters as well. Fassbender and McAvoy give strong performances as they pick up where they left off from the last movie. Dinklage delivers as well as a defense contractor who sees the mutants as the biggest threat to humanity. Seeing these characters in Paris in the 70s costumes and hair works is a nice touch. The performances and sets would let the movie stand on its own merit, but the added special effects are the icing on top. Bottom-Line? Strong performances, great action and a clever plot make X-Men: Days of Future Past one of the best summer blockbusters, thus far.